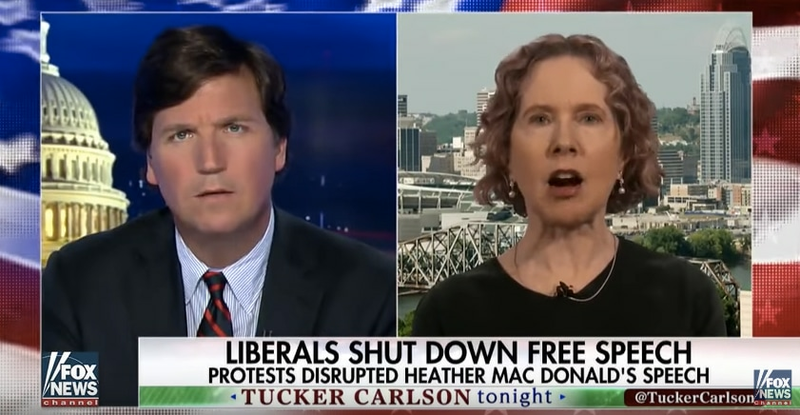 Is Fox News following Trump’s lead by using the school’s free speech legacy against it? Both Fox News personalities Jesse Watters and Tucker Carlson appear to be taking President Trump’s lead, rhetorically twisting the University of California at Berkeley’s free speech legacy against the school. 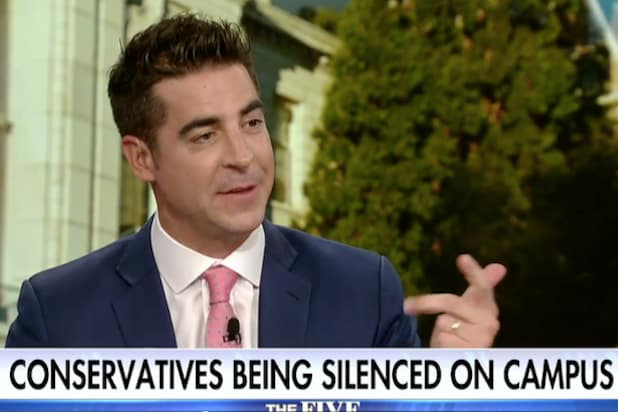 During Wednesday night’s Fox News broadcast of “The Five,” on which Watters is a newly-minted co-host, he appeared with guest Ann Coulter, who announced earlier in the day that she canceled her scheduled speech at the northern California university after losing the support of conservative groups that sponsored her appearance. Coulter told the New York Times earlier in the day: “It’s a sad day for free speech.” The conservative commentator initially insisted she would go to the Berkley campus even after the university cut her planned speech, citing threats of violence. But Coulter now says she does not see how she could go forward with it. With Coulter present, Watters presented an argument that made the university — which was the birthplace of the free speech movement in the 1960s — out to be hypocritical on the topic of providing “safe spaces” to all groups and ideologies. “They caved to the mob and the mob won and the mob is emboldened,” he said. “I looked on the Berkeley website today — I had a lot of time on my hands — and they have safe spaces for just about anybody,” he added, citing minority groups including Muslims, American Indians and undocumented students. “But they don’t have a safe space for a conservative,” Watters continued, suggesting that the university isn’t effective in its addressing of violent protests on campus and that authorities may be turning a blind eye when it comes to the likes of Coulter and other conservative provocateurs, such as Milo Yiannopoulos. Both Carlson and Watters seem to be echoing President Trump’s previous stance on the matter. Trump took to Twitter in early February to express his outrage at the historically free-speech friendly campus after violent protestors clashed with police over a speaking event at which conservative Breitbart editor Yiannopoulos was scheduled to appear. The president claimed that the school didn’t “allow free speech,” and also posed an apparent threat to cut federal funds to the school.